What is nutmeg? About the ingredient nutmeg. Including 2,818 recipes with nutmeg, nutrition data, and where to find it. Nutmeg and mace have similar taste qualities, nutmeg having a slightly sweeter and mace a more delicate flavour. Mace is often preferred in light dishes for the bright orange, saffron-like hue it imparts. Nutmeg is always used in ground or grated form, and is best grated fresh. The essential oil is obtained by steam distillation of ground nutmeg, and is used widely in the perfumery pharmaceutical industries. The oil is colourless or light yellow, and smells and tastes of nutmeg. It contains numerous components of interest to the oleochemical industry, and is used as a natural food flavouring in baked goods, syrups, beverages, and sweets. It is used to replace ground nutmeg as it leaves no particles in the food. The essential oil is also used in the cosmetic and pharmaceutical industries, for instance, in toothpaste, and as a major ingredient in some cough syrups. In traditional medicine nutmeg and nutmeg oil were used for disorders related to the nervous and digestive systems. Nutmeg butter is obtained from the nut by expression. It is semi-solid, reddish brown in colour, and tastes and smells of nutmeg. Badia - Ground Nutmeg - 16 oz. 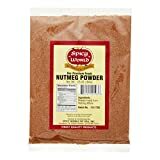 Pure Ground Nutmeg from Spicy World Comes in a 100 Gram (3.5 ounce size) - Value Size! Product of India Very Prime Quality! NET WT 1.98 OZ (56g). From the East Indies, nutmeg is great for desserts and baking and is a flavorful addition to cheese dishes. Also used in European, Middle Eastern and Indian cuisines. Nutmeg is usually found in the spices section or aisle of the grocery store or supermarket. Nutmeg is a member of the Spices and Herbs USDA nutritional food group. How much does nutmeg weigh? There are 2864 recipes that contain this ingredient.